YG Entertainment, home to some of the biggest names in K-pop, will be launching yet another all-out, fight-for-survival boy band reality program with the goal of creating the agency’s newest seven-member boy band ― iKON. 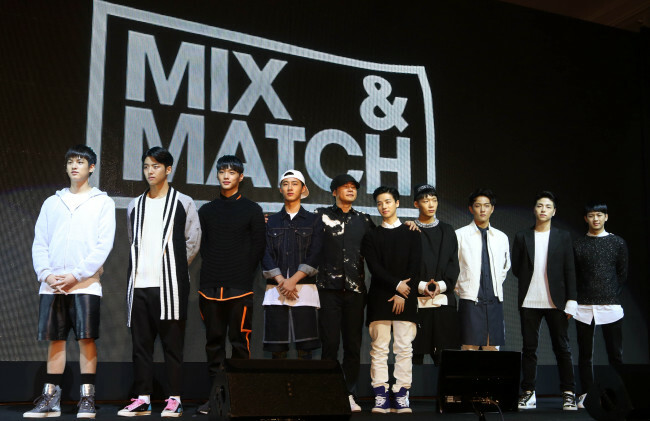 The upcoming show, “Mix & Match,” comes a year after YG aired its hugely popular “WIN: Who Is Next?” TV series ― on which two teams made up of the agency’s top trainees competed against one another to make their debut as the boy band Winner, the first boy group from YG since it debuted Big Bang nine years ago. The agency’s new reality show will feature all the members of last year’s losing team, Team B, as well three new YG trainees, for a total of nine battlers this time around. However, it was announced at a press conference that previous Team B contestants B.I., Bobby and Kim Jin-hwan were already confirmed members of the upcoming boy group iKON, meaning the fate of the rest of the show’s six trainee contestants lies mostly in the hands of the public. “As I promised before, the winners (of ‘WIN’) will make their debut, and the losers will disband or undergo changes,” Yang told reporters at the Conrad Seoul hotel on Tuesday. During the filming of last year’s “WIN,” YG founder Yang stated on numerous occasions that he would not debut the losing team without changes. And despite the team’s popularity having led to a number of international fans launching online petitions for YG not to disband the group, the CEO is reiterating his promise that changes will be made. “It has already been decided that we will form a seven-member group ... the winners of this battle will debut under the name ‘iKON,’” he explained, adding that “k” was chosen of instead of “c” because the members are icons of Korea and K-pop. The six K-pop artist hopefuls are previous Team B contestants Gu Jun-hoe, Song Yun-hyeong and Kim Dong-hyuk as well as three other YG trainees who are new to the public eye ― Jung Jin-hyeong, Jung Chan-woo and Yang Hong-seok. As the title of the show suggests, based on the skills and abilities of the contestants, the members will be mixed and matched into various teams to see which members best compliment the already-confirmed members of iKON. “The other three members (of the former Team B) have not been in training for very long and, to be harsh, their skills are not yet at the levels of B.I., Bobby and Kim Jin-hwan,” Yang responded when asked why only three of the past Team B members made the cut for the upcoming battle series. Yang also confirmed that rapper B.I. is slated to be the leader of the future iKON, as he was when he was a member of the former Team B. Aside from his team having lost last year’s competition, the young rapper has under a black cloud recently as he had a less-than-stellar outcome during his recent participation as a contestant on the popular hip-hop survival program “Show Me the Money 3.” On the show, B.I. forgot many of his lines during the auditions and live performances and was ultimately eliminated. “I think just like G-Dragon, he has the potential to be a great songwriter and composer,” he continued. “It is possible, like our past trainee who wasn’t able to make the cut for Big Bang, for him to make his debut through another company,” he added. Although it is still possible for fans to see the original Team B members come together once again ― plus another new member ― it all comes down to voting. It was stated that YG Entertainment officials and artists will account for 30 percent of the votes, while fan votes will account for the remaining 70 percent. YG has already begun filming the show and is slated to air the first episode of “Mix & Match” via Naver and Mnet on Sept. 11. The show will air every Thursday at 11 p.m.